Thinking of getting an e-book reader? If you read outside a lot then get a liquid crystal device. The screens are greyscale only but are just as easy to read in bright sunlight as indoor light. A fully charged battery lasts weeks on them. Amazon paperwhite is an excellent device, you can even read it if there is no light e.g. in bed late at night. Amazon's Kindle Keyboard - if you can find one - is worth getting too since it will also play mp3s while you read and read books to you. They are available on eBay and sometimes Amazon have reconditioned ones. If you want something more versatile (but not good in bright sunlight and needing more frequent charging) then there are various Android tablets available. If you like things simple and buy mostly from Amazon - get a Kindle Fire HDX. It has an incredible screen and their Mayday button solves any problems you have using it. My wife Shelia has one and loves it. Get the 32 GB version though - you won't regret spending the extra. If you are like me and love to tinker with technical stuff get the new Google Nexus 7 instead (32GB) - It's not as user friendly when reading books from Amazon but it's far more versitile when you want to use apps from the Google Play store. Many of the questions you have can be answered by the game's help page. Look for the 'Help' tab at the top. If your question isn't answered there - or here, you can post it in the comments below. Find out how many neighbors I have? 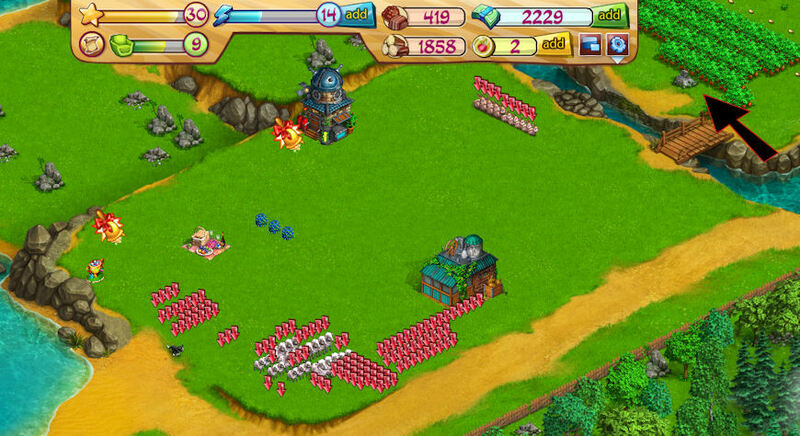 Find the rocks on my farm? Put cows in the the cowshed? The trick is to have lots of friends playing the game. You can wait. Your energy will refill at 1 energy every three minutes. Sometimes you can get energy from opening nanochests on friend's farms. You get three free gold when you start the game and reach the end of the tutorial section. Watch your wall for any friends who have completed level 5 of the daily bonus. The reward is 1 gold. You'll have to be quick though, since there is only one available. If you play the game every day for five days and complete the daily bonus you'll get a gold as a reward. If you buy the gold mine (for 250 gold) you get one gold as a bonus every day. You might think that price is extortionate but the investment has a 150% api. Buy it with Facebook credits. That may go against the grain but remember that we pay for other forms of enjoyment. It works out less expensive than other methods of spending your time. You are also paying for the game to be developed further. ...get sour cream to feed the cat? You'll need 10 of these, When you first get the cat you'll just have been rewarded by getting to level 7 with enough to feed it the first time. With 100+ neighbors it's easy to get cream. If you have the dog - make sure it has been fed but not if you are trying to get combos while visiting friends. Use the fastest form of transport available to you. If you have a partner, switch to them as soon as you get a monster, harvest some more them switch back and shoot the monster. The quickest way to switch is to click the partner. Have a large, wide area filled with trees. Two lots of 'medium nano woods' should do for a start. Accept friend help and let the cat get the rewards. At the same time start harvesting trees at one side. Click steadily, collecting rewards as you get them. Remember the cat won't collect rewards which fall in water! Get your rewards as they appear. 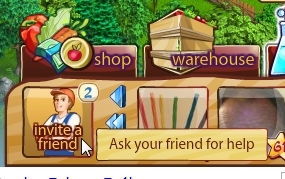 As soon as a new help from friend message appears, click 'Yes'. If you get a monster, shoot it with whatever weapon you have selected. 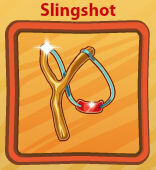 I use the slingshot mostly. Each shot earns you rewards which count towards the combos. Get rid of the message which appears as soon as you get it because it stops you clicking further. If you run out of trees - click animals which need feeding. With practice you'll be able to anticipate the trees and go shopping for more if you have 900 cash. 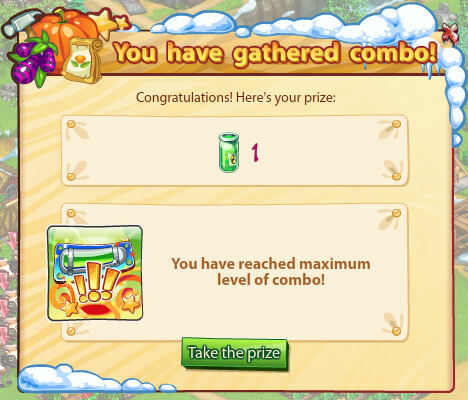 When you get to combo level 7 - keep clicking the award is given at the end of that level. 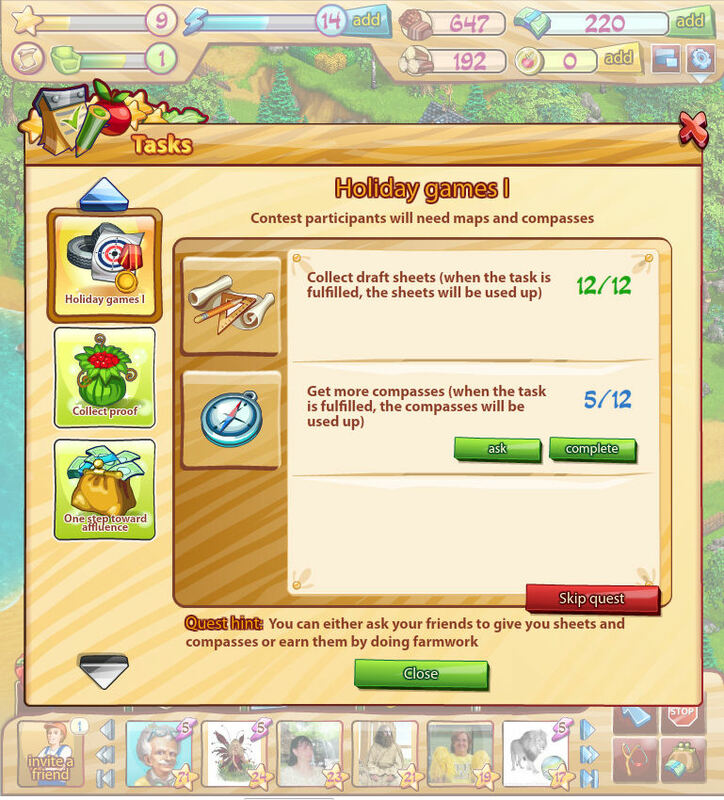 You can also get combos with any farm actions including visiting friends and even friends visiting you (provided you have good neighbors). Combo rewards are toxin, radium, bronze, aluminium, neon and a large amount of XP and other goodies. These are always available. 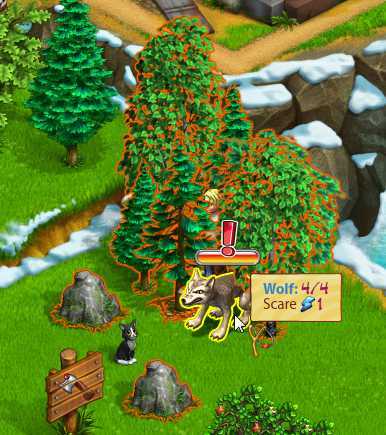 Using one costs one energy and is powerful enough to scare the wolf off in one go. You'll have to make these in the workshop. You can also get 3 beegun shots by trading in a monster teeth collection. 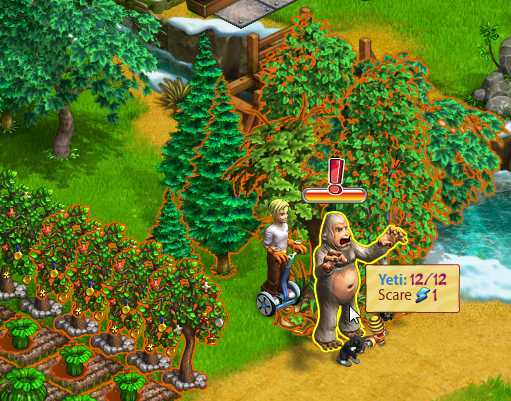 Beeguns get rid of Yetis in one shot. The number underneath the picture is how many shots you can fire. To make the beegun you'll need 1 hive and 1 tube of glue. Zap it with which will get rid of it in one shot. This one is grayed out though meaning it isn't available. That means you may need two or three shots with a beegun. 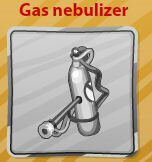 The gas nebuliser is made in the workshop and requires two motors, 1 toxin, 3 powder and 4 metal to make it. Zap it with which will get rid of it in one shot. This one is grayed out though meaning it isn't available. That means you may need two or three shots with a gas nebuliser or even more shots with a beegun. The nanoemitter is made in the workshop. You must be on level 22 or higher to make it and requires 3 bronze, 3 bolts, 2 aluminium and 2 mushrooms to make it. If you have the dog AND he's been fed with 10 meat he will help you deal with monsters - it will require fewer shots, slingshot and beegun will be enough. ...see what's available in the daily bonus? Apart from getting five rewards on the 5th day you'll also get a free gold! Incidentally every 5th day make sure you share the reward because it's also one gold! ...find out how many neighbors I have? 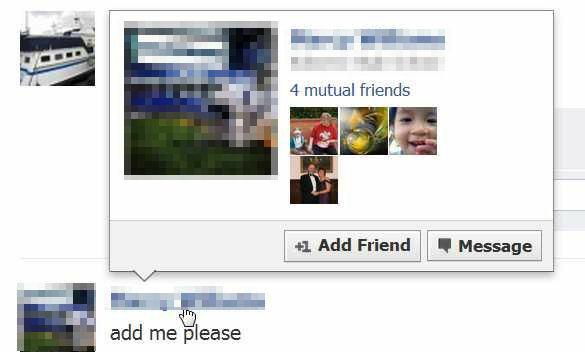 Click the button 'Invite a friend'. In the window which opens you'll see the number of neighbors at the top. 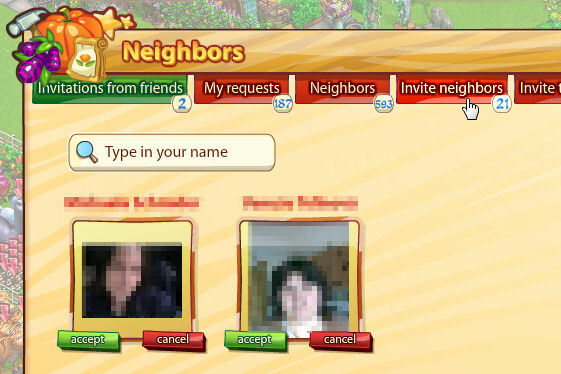 While you are there, send requests to anyone who appears when you click the 'Invite neighbors' button. In the popup window which appears it shows that you have four mutual friends. This person is reasonably safe to add as a friend. In this example you share no common friends. It would NOT be safe to add many new people like this in a single day. Risk no more than two and message them first. If you can't send them a message, respond to their post and wait until you get a reply. Click the 'Invite a friend' button. Use the 'Invitations from friends' tab to accept any existing invitations you have been sent. Use the 'Invite neighbors' to send any of your new friends an invitation to be a neighbor. ...Turn the sound off/on and change the scale? The dropdown reveals the + and - screen scale icons, a film icon - allowing you to turn off screen animations, a speaker icon allowing you to turn off sound effects and a music icon to turn off the music. The icon to the left of the cog makes the game full screen. The music and sound effect volume can also be controlled. I got the first expansion at level 20 (after completing the 'Stock' mission - 3,000 wood and $5,000). The second comes at level 22. You'll need to rebuild the bridge to get to it. The third expansion is available around level 30-32; you'll need to complete the 'New territory' missions which includes buying it for $75,000 and then the 'Logjam' mission (get 15 dynamite; clear 1 debris15x $1,000 + 200 wood;50 powder, 50 phosphorous, 40 metal). The fourth expansion appears around level 35. You'll need to complete the achievement 'Research of the territory' and feed the dog. To use the fourth expansion fully you'll need to rebuild the teleport also. 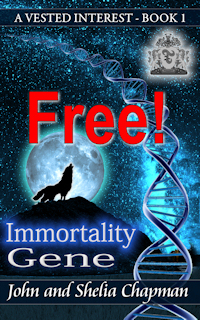 This will send one to each of your neighbors and you should get lots back in return. Tips - If you are short of space put tiles under all your buildings and in their 'shadow'. Put decorations or animals on top of the tiles. Stack high comfort items in the building shadow. The white wicker gate gives +3 comfort and costs just $50. Send them out and you'll get them back. See above for the method. You'll notice you have two options 'accept' and 'thank' on some items. If you want to accept the gift and return one to the sender (you both get the item) then choose 'thank'. If you just want to accept the gift (only you get the item) then choose accept. Why would you want to be so selfish? You may want to send a different gift back. Some gifts are allways available - paint, energy, glass, motors, bolts. If you thank someone for sending you energy then you can't send them a bolt on the same day. This doesn't stop you from sending gifts of other collection items you have available. Hint - accept gifts BEFORE you answer messages! You and the sender may get double gifts that way. Click the magnifying glass under the item you want. Sometimes there is a megaphone icon there also. Click it to post a message to your wall saying you want that item. It appears to do nothing so only click it once. You can have five items in your 'wish list'. Friends who have these items can send you them. You can see someone's wishlist by hovering your pointer over their name at the bottom of the screen. You can't send them items which are grayed out. If you hover over the non-grayed icons you'll see how many of these you have. Clicking the icon sends the friend the item. 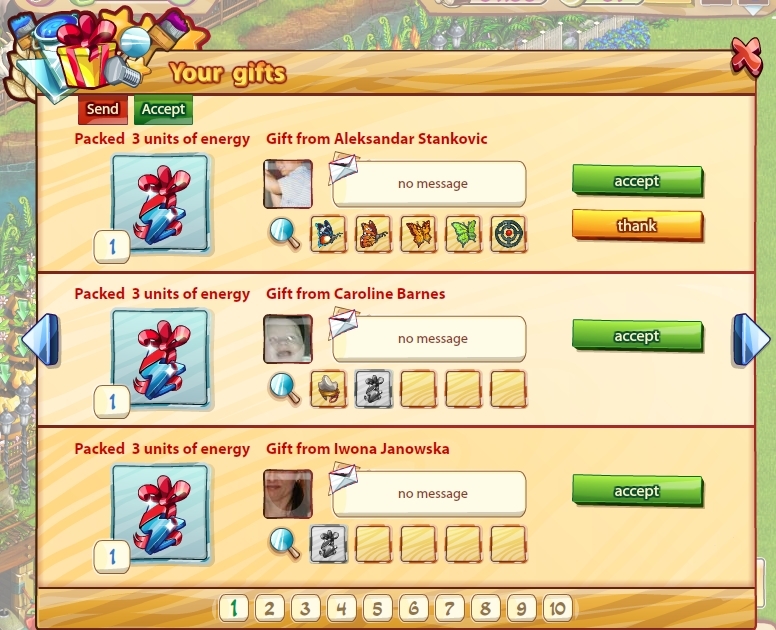 You can also request gifts by sending out gifts. The person receiving the gift will see two buttons on their gift window - 'Accept' and 'Thank'. Provided they click the 'Thank' button first, a copy of the item will be sent back to you. 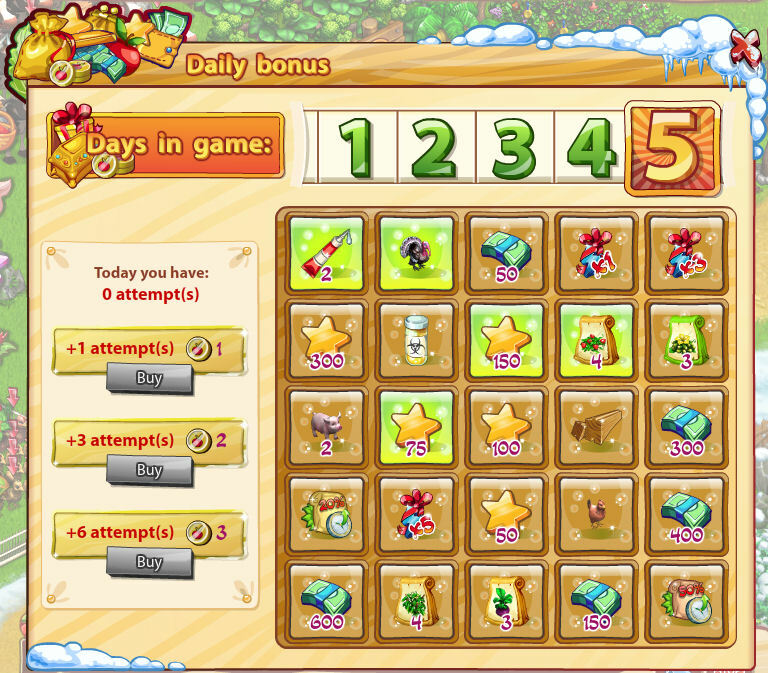 You can send each friend 1 gift per day using 'Gifts'. You can send many collection items via the person's wish list... but there is a limit. Once a friend has reached their gift limit, you won't be able to send more until the next day. Paints, glass, motors, bolts and energy can be added to the wish list but each person can only send one of these per day. You can't do this. 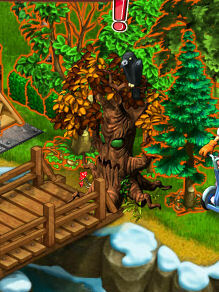 You need the animal houses only to increase the number of animals you can keep. ...find the rocks on my farm quickly? 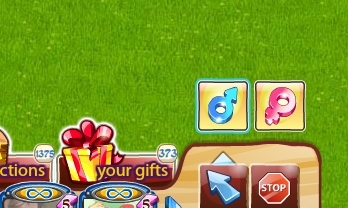 It would be nice if there was a button to show hidden objects but there isn't one (yet?). If a rock is hidden behind a building or amongst trees you can discover them by moving your pointer over the area. If there's a rock it will change to a pickaxe. When the map re-opens the rocks will appear first and you can note their positions. Take a screen capture if you have suitable software - e.g. Windows key + 'S' if you have MS OneNote. This is one case where a slower Internet connection and computer can be an advantage. A rock hidden behind where the mill will appear. Move your mouse over the image to see it after the game fully loads. If you can't find any rocks (or trees) needed to complete a mission try clicking the help button in the mission description. You'll get a red icon pointing at where the rock/tree is. You can get toxin as a reward for a complete butterfly collection. get the butterflies by harvesting hybrid plants at yours or your neighbor's farms. The same method seems to work when looking for eggs and milk. You can also get metal from nano-chests, by trading in a precious stone collection and as the bonus from the magnetron. Aluminium is obtained from breaking rocks. These can be either on your own farm or on the farms of your friends. It's also the bonus obtained from the blast furnace (despite blast furnaces making iron - aluminium is made by electrolysis in a smelter). You can also get aluminium from the nano-chests. Radium is also obtained from breaking rocks. 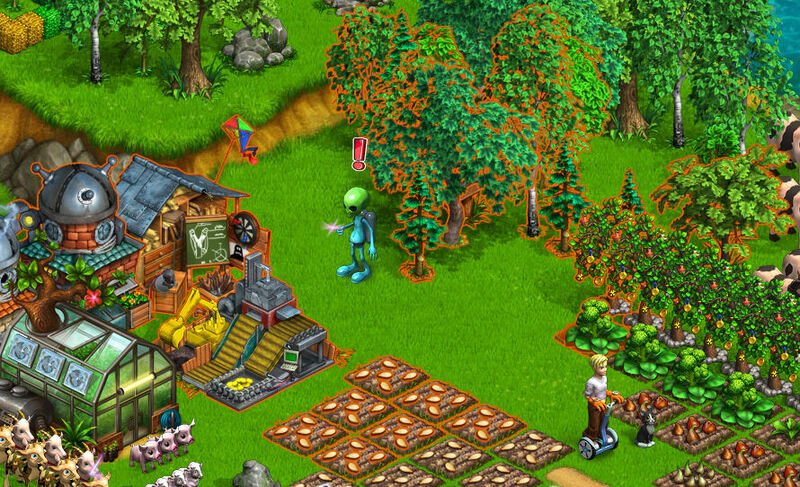 These can be either on your own farm or on the farms of your friends. It's also the bonus obtained from the neutrino (despite a neutrino being a sub-atomic particle not a machine). You can also get radium by cashing in a seashell collection or from the nano-chests. 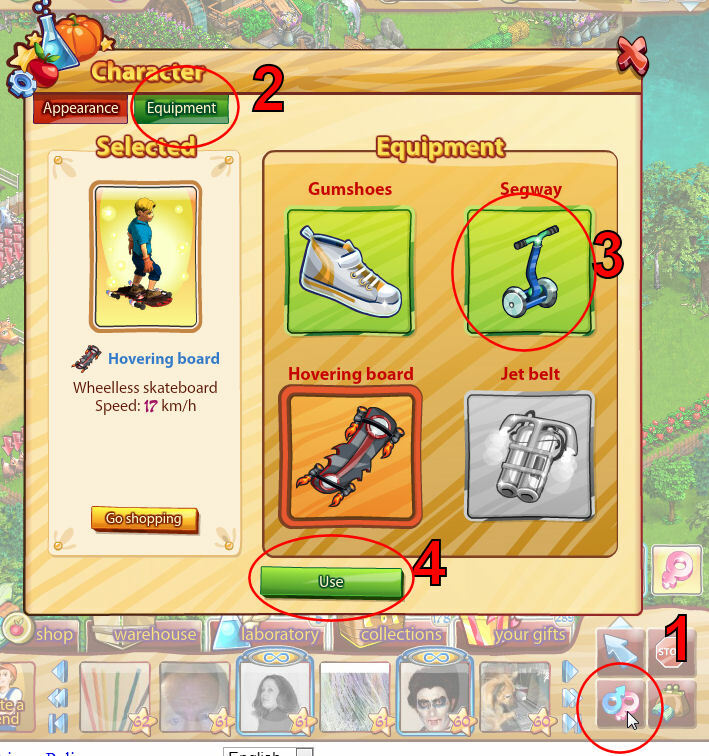 ...use the segway, hover board or jet belt?